Grew Up… at Hogwarts School of Witchcraft and Wizardry, where he was a proud Hufflepuff. Although he was a bit of an outsider due to his interests, Newt was nevertheless completely dedicated to the study of magical creatures. But when one of his experiments with the creatures got out of hand, he was expelled from Hogwarts despite Albus Dumbledore’s defense of him. Living… in a magical suitcase (it’s bigger on the inside). Living in a suitcase might sound pretty horrible, but Newt’s suitcase is out-of-this-world amazing, full of magical habitats and creatures. Visiting… the United States. 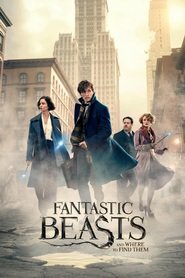 After traveling around the world studying magical creatures, Newt arrives in New York City for a layover. However, his plans go completely awry when his creatures escape and he’s pulled into the lives of a No-Maj (a non-magical person) named Jacob and a disgraced auror named Tina Goldstein. Profession… magizoologist. The study of magical creatures is Newt’s life calling, and he’s brilliant at it. After his extensive travels, he’s writing a book called Fantastic Beasts and Where to Find Them, hoping to de-mystify magical creatures and convince wizards to not mistreat or misunderstand them. Interests… studying, caring, and playing with magical creatures. Oh, and drinking tea. The three objects most important to Newt are his suitcase, his tea kettle, and his book. Relationships… single. He’s been burned by love in the past, and now he’s a little downtrodden and understandably reluctant to be hurt again. Personality… nurturing, quirky, and awkward. He is barely able to make eye contact and is sometimes painfully awkward. Nevertheless, his honest love for magical creatures and his empathy and desire to help others, even when he has no reason to, make Newt oddly charming. Newt Scamander's popularity ranking on CharacTour is #536 out of 5,000+ characters. See our top-ranked characters and read their profiles.